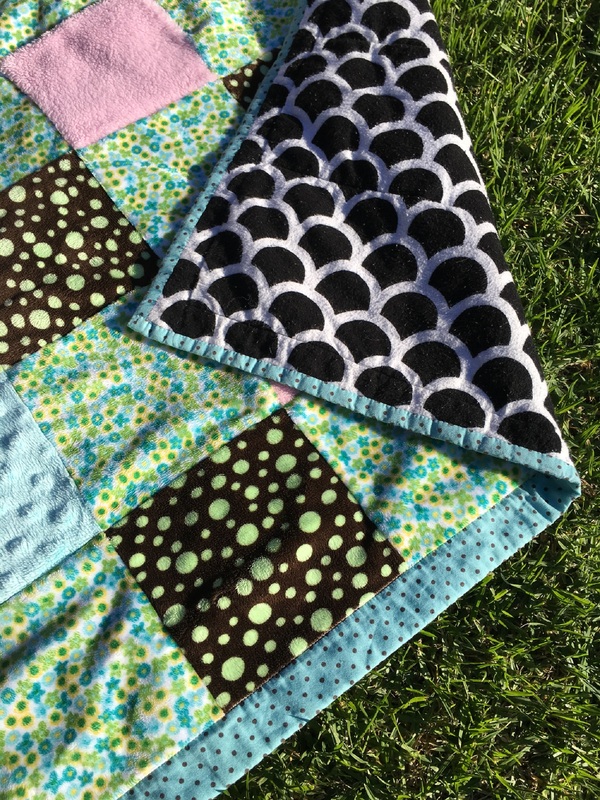 Last year I made quilt in minky fabric for my daughter, on her request. We found two lovely pieces of minky fabric at a craft show that we bought just because they were wonderful, soft and the right colours. We got it out again last week because the nights are getting a bit chilly here in Melbourne this time of the year. It wasn’t enough fabric so I added some scraps from two bathrobe projects. I also bought some printed flannelette fabric for backing that I washed before I used it. I had a piece of left over bamboo batting that luckily was big enough. 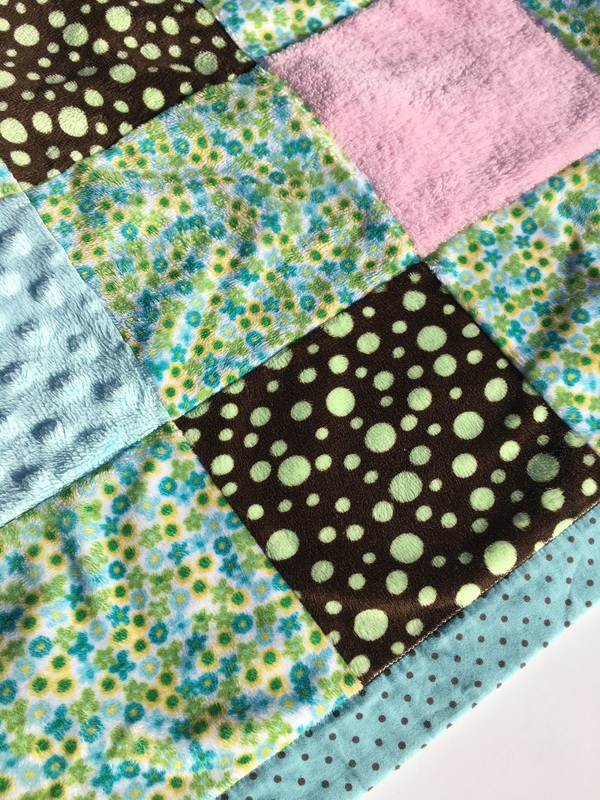 I cut the minky fabric into 6″ squares, I pieced them together with the over locker into 11 rows with 9 blocks in each row. Both the over locker and my sewing area needed a good cleaning after that. 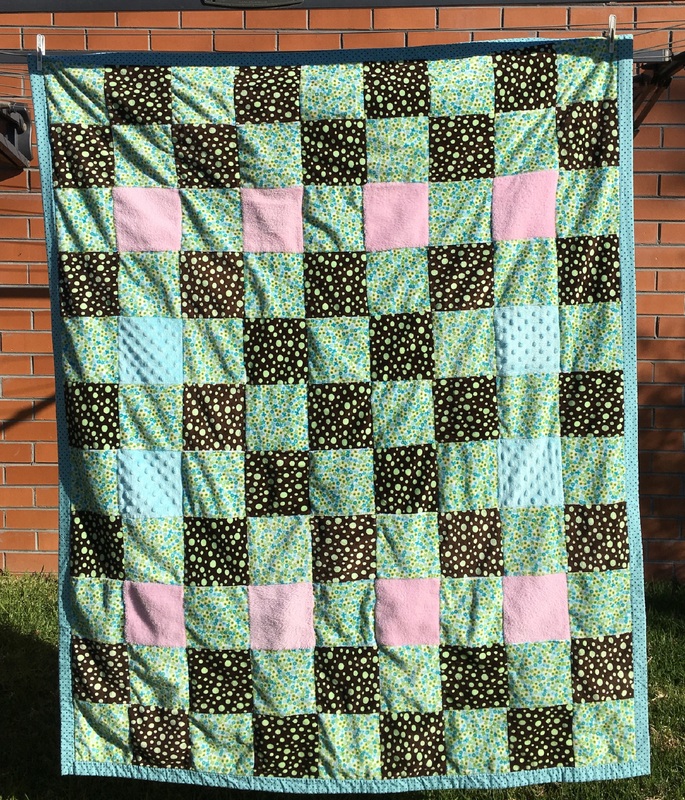 I quilted in the ditch,with a walking foot on a normal sewing machine. I did a wide binding by cutting the backing and batting 1″ outside the quilt top all the way around after quilting. I cut 4″ strips for binding, that I sewed together with diagonal seams and folded lengthwise wrong sides together. I attached the binding along the edge of the quilt top with a 1/4″ seam allowance, make sure the bobbin thread matches the backing. I folded it over the edge of the batting/binding and slip stitched it in place on the back of the quilt. It is a really warm and soft quilt.